To make things more clear the former intro page is cleaned up. On this post the old text is saved. — Please bring your own multimeter(s!!! 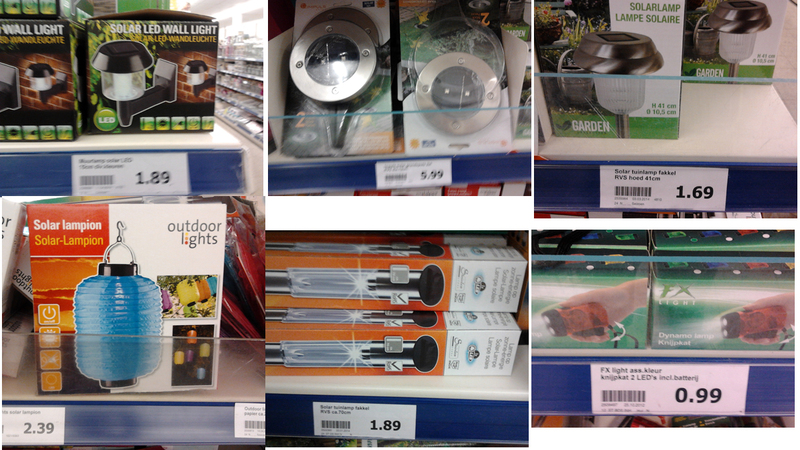 ), see pictures- we need to measure a lot. — If possible also breadboard, jumperwires. Charging circuits can be very simple but to improve efficiency the circuits becomes more and more complex. This session will start making a basic charging circuit, understanding the principles of charging and some basic improvement and tricks. 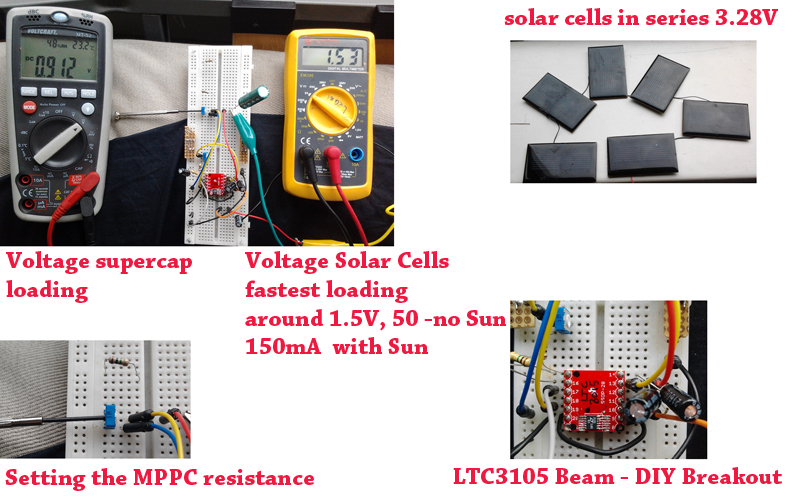 Also about batteries to be charged, NI-MH battery, problem of charging Li-po batteries, supercaps etc. There will be a “no headache” group exploring the inventivity used in cheap Chinese gadgets. These gadgets contain just a few simple – but smart – components and are easy to redesign or hack into quick and kitschy prototypes. Later on you can always get more designerish! With more ambition you start exploring high voltage - ultra low current Piezo harvesting. 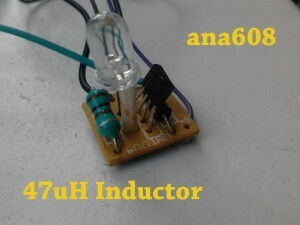 This is catching tiny energies although pinching of a Piezo element can produce up to 20V for a short time! Piezo will start rude and crude (simple circuit, rectifier bridge, voltage delimiter circuit), but you can also experiment with the LTC3588 miracle chip, either the Sparkfun board or the DIY (Beam-made) board. Picture of the DIY Beamboard harvesting (enormous (- tiny)) amounts of energy from pinching a piezo element: (loading a 22microF Cap), every push produces 30.0 milliV !!! For the connaisseur: this LTC3588 is a buck circuit (not a boost) because the Piezo produces lots of Volts (eg 14V). These Volts must be DC-DC-ed downwards to 3.3V. 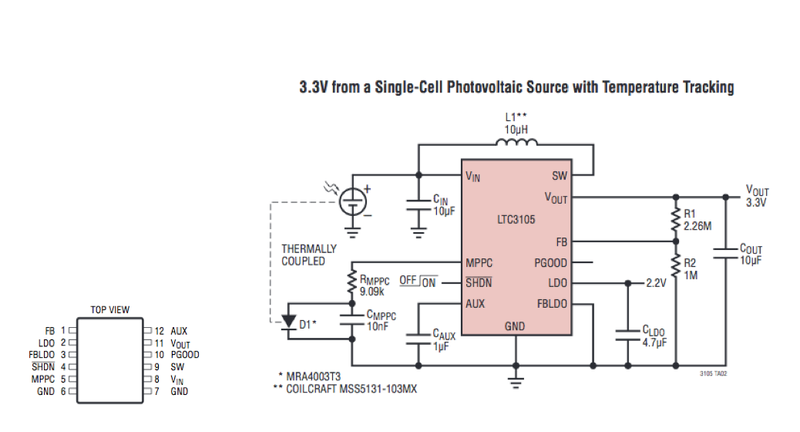 When your intellectual ambitions are not yet satisfied you start experimenting with a (solar) MPPT circuit. MPPT stands for Maximum Power Point Tracking and tries to reach the optimal point in exploiting solar cells. 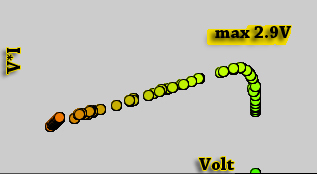 This optimal point is found maximizing the P=V.I relation for solar cells. This starts with lot’s of measuring and making plottings of the V, I, V*I values. From this the MPPT of different solar cells is established. 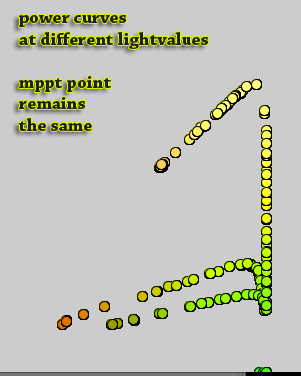 This MPPT point was reasonable stable in different lighting conditions. 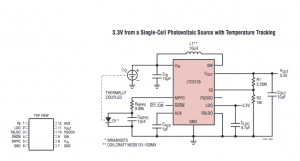 Every solar cell can have different V, I and so MPPT values. MPPT point tracking (using 2 inamps at analog pins), connected to an arduino which sends data to Processing, which plotted this graph. 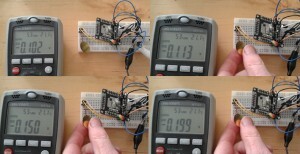 The LCD connected to the arduino shows the maximum value, but a diagram is more convincing. 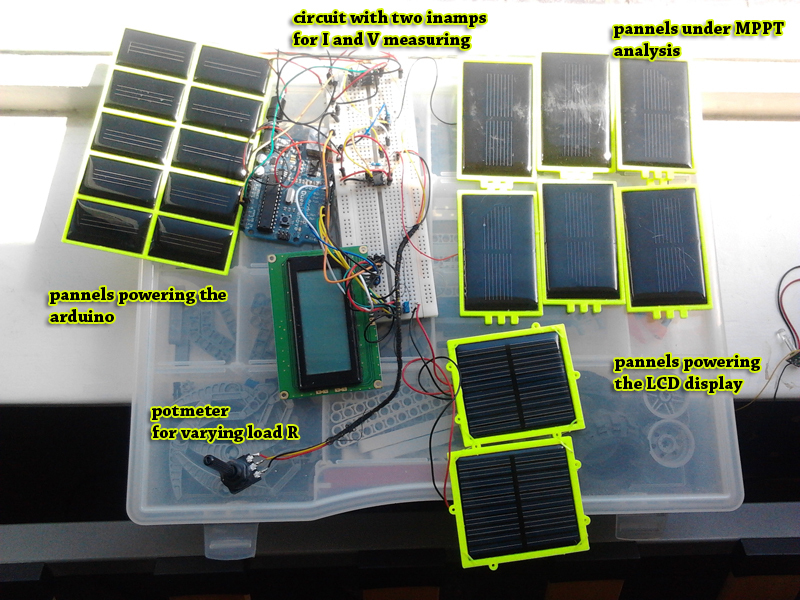 Setup with a self powered MPPT analysis: the arduino is powered by the left solar cells, the display by the lower cells, and the cells on the right are investigated. (at the moment the LCD is giving a number, but you could make a graph too, using the user-defined characters, may be later…). 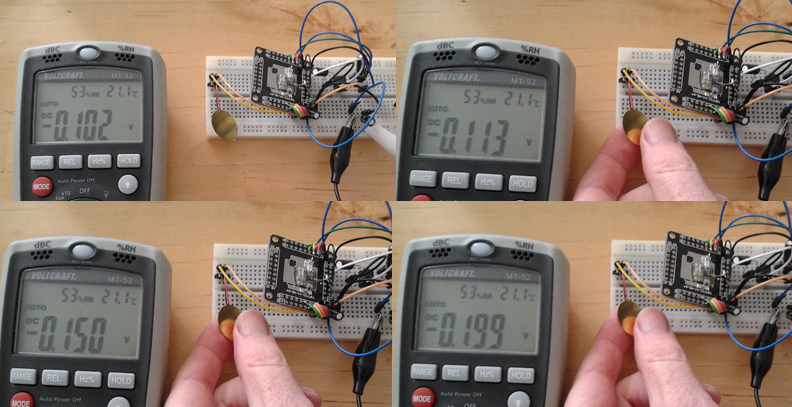 The arduino is sending the data to the Serial, so we made these graphs above with Processing. Then we take advantage of this knowledge with clever IC’s. This is an important video explaing the use of the harvesting MPPT IC’s: https://www.youtube.com/watch?v=lrELRVFEx_s, because we don’t have an internet connection in Paillard, please look at it before! Again, either we work with the Sparkfun and/or the Beam-made board, using the same IC. Last but not least we have a Konstantan/Coopper weaving micro energy harvesting group. This harvesting is based on the Seebeck-effect and requires weaving of copper and Konstatan. Then we need a temperature difference, by putting ice on your body It is the reverse of a Peltier element. parts from inside a garden lamp (ANA608, fast switching IC), dynamo torch (muscle energy! 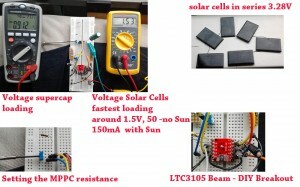 ), solar cap. using a voltage delimiter LM317: to limit danger from eg high voltage producing piezo components. But this IC is just cutting off energy! We can do better! Beam simplified this setup: just a resistor on the MPPC PIN and a solar cell. Beam had a (250K) V-divider on the FB PIN to set the maximum loading voltage (for a 2.5 supercap) at 2.1V. Then a 1M Ohm V-divider on the MPPC PIN. Setting the resistance on this PIN is setting the Voltage on which the solar cell operates, so that the cell is not drained to 0V. Changing this MPPC resistor setting really makes a big difference in loading speed (MPPC or MPPT means keeping the solar cells at “best” performance). After reaching the voltage set by the FB PIN, 2.3 the circuit shuts of, preventing the supercap to explode and become a supernova. Accordingly if you blink (say 1000 milliseconds) once a minute: 1/60 of the time: 0.0021 W, will run for around 4-6 hours on 31J. 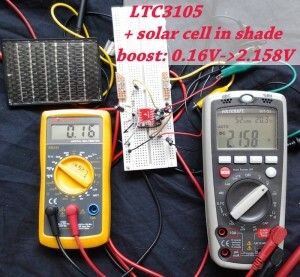 The main advantage of solar lawn solar energy to work during the day when the sun shines on the solar cell, the light energy into electrical energy stored in batteries, and then in the evening for the lawn of LED (light emitting diode) provided by the battery power supply. Its main advantage is safety, energy saving, convenient, and environmental protection. Solar Lawn controller ANA608 is a company based solar lawn work features specially developed, using the TO-94 package, very few external components, ease of production; The controller has a high conversion efficiency: 85 ~ 90% (typical value) , solar panels can reduce power requirements; output current can be adjusted; current consistency is good.